In the Chinese lunar calendar, we are currently enjoying the Festival of the Nine Emperor Gods, a Taoist celebration known here as Tetskagaan Kin Je, or the Vegetarian Festival. It runs for nine delicious days, most famously down in Phuket, where over one-third of the population is Chinese. Chinese temples bring out the dragon dancers, music floats all day across the river, and celebrants make merit by abstaining from meat and, sometimes, wearing all white. 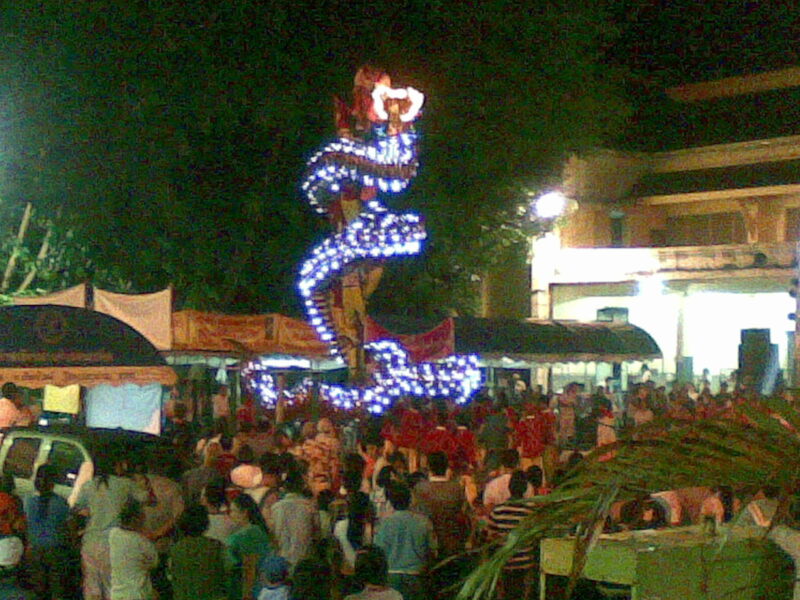 Fourteen dragon dancers climb a pole, so that the dragon can writhe and fly. Photo courtesy of Ken's cell phone, and taken on the way home from eating lemon chicken, banana-leaf salad, and miang come (betel nut leaves wrapped around plum sauce, chili peppers, peanuts, and roasted rice). 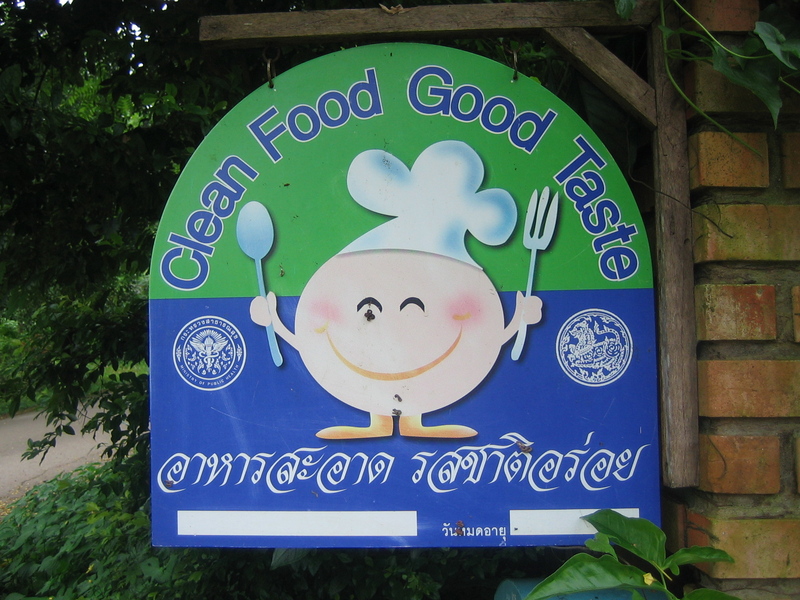 In this period, Chiang Mai’s restaurants and market vendors bring out vegetarian specialties and versions of their usual dishes not seen at any other time of year. They broadcast their participation by large yellow signs broadcasting their je (vegetarian) dishes. This week, even enthusiastic carnivores like us salivate in response to yellow plastic banners. Pi Aeh is Chinese-Thai, and she featured a vegetarian version of khao soi. Instead of a chicken leg, Madam Khao Soi doled out slices of faux chicken composed of tempeh, meaty mushrooms, and luuk chin je, “fish” balls made out of flour, soy, and ground mushrooms. I don’t care for fish balls in noodle soup, so these are a rare treat for me. Pi Aeh also had a special of fresh spring rolls wrapped with a tender wheaten crepe, rather than the usual rice noodle, and sent us home with a package of kanom jin nam yaa, a medicinal curry served over rice vermicelli. But it’s been the bounty of market treats that Ken’s been bringing home for dinner that has really been the heart of the festival for us: gaeng mussaman (another Muslim-style curry, always featuring chunks of potatoes) and gaeng kieaw wan, green curry, with chewy clouds of some soy product I’ve never encountered but now adore; gaeng som, a Southern-style sour orange curry thick with bamboo shoots; green beans stir-fried in a spicy dry red curry, with balls of deep-fried tempeh; crispy pea-pods and cauliflower and enormous meaty slices of mushrooms; yellow Chinese noodles dressed in oil and mushroom broth, with slices of firm Thai tofu, and slivered kale. All kinds of Chinese sweets have appeared as well. Our particular favorite are the fat little peanut cookies, iced with a salty yellow egg-yolk glaze, and stamped with a peanut half on top. If this is making merit, then let me make some more. Saarai thawt grawp, deep-fried seaweed, has completely supplanted the spicy peanuts in my snack repertoire. 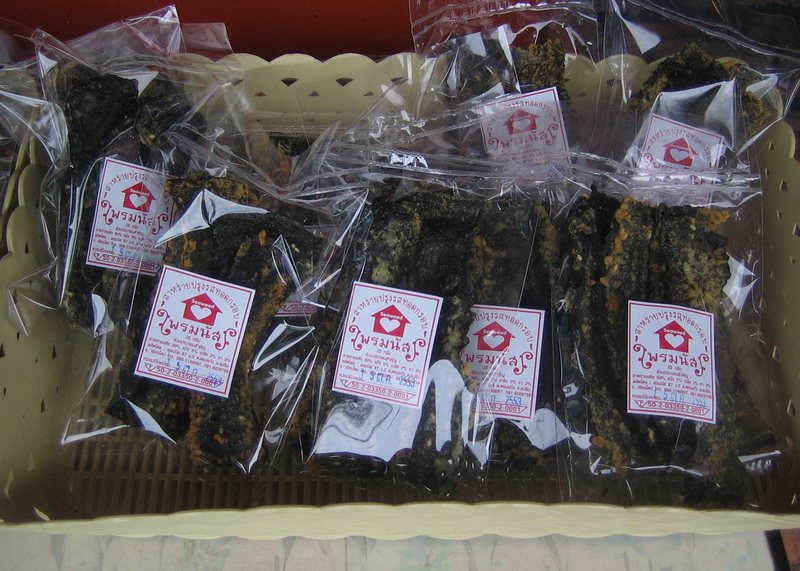 Unusually thick sticks of nori are dipped in a salty batter, deep-fried, and sold in ten-baht cellophane packets of five or six sticks. The brittle nori breaks into large savory fragments, while the bubbles of the fried batter pop crisply against the roof of the mouth. It meets all possible umami, salty, and crunchy needs. It travels surprisingly well, but needs to be eaten relatively soon after purchase. Like all pleasures, that much crunch is transitory. Mit Mai, the Yunnanese restaurant in town, breaks the most important rule of choosing where to eat in South-East Asia: eat only where there is a crowd gathered. At Mit Mai, we are rarely joined by any more than perhaps one other couple, and yet, the food is consistently delicious. Their ingredients are brought down personally for them from Yunnan Province, so when we order, we cannot set our hearts on anything in particular. They may be out of the dried Yunnanese ham, and it will be another few days before it’s trucked down through Laos. The same goes for the Yunnanese beef. Thankfully, they always have Yunnanese cheese on hand. It’s a goat’s-milk cheese, known as rubing, and is a specialty of the Bai area, mild with just a little bit of funkiness. I am grateful for that little bit of funk, as it puts the kids off of it enough so that Ken and I can have the whole plate. 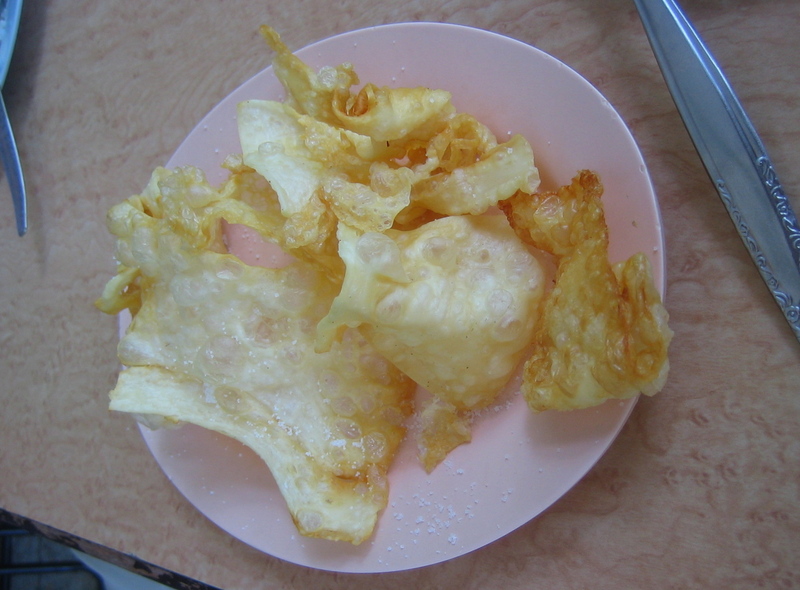 At Mit Mai, they slice it very thinly, deep-fry it, and sprinkle it with coarse salt. Another specialty trucked down through Laos is Yunnanese pickles, very finely shredded cabbage brined and soured. It’s treated as a flavoring, not as a side dish, and stir-fried with various other vegetables to create the final dish. I am particularly fond of the potatoes with pickles. 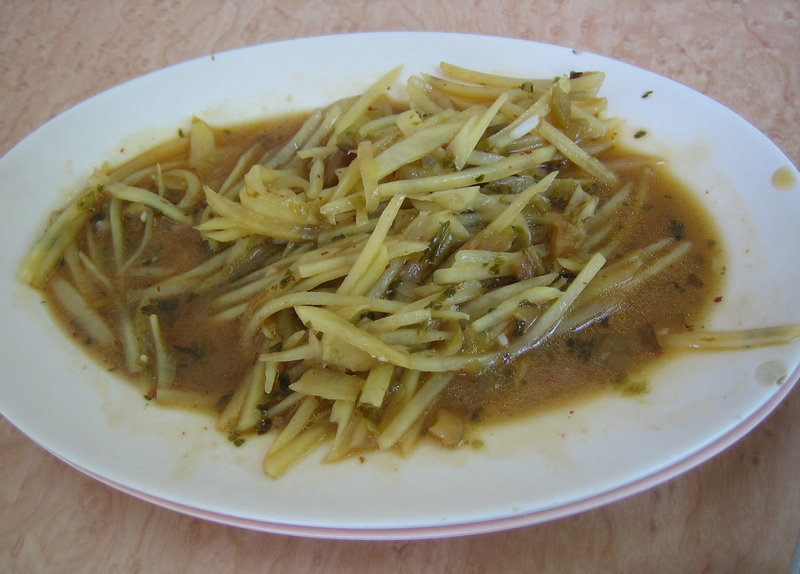 In China, thinly-sliced potatoes are often cooked like any other vegetable: stir-fried until they are still crisp. Here, the shreds of stir-fried potato are combined with the pickles to create a wet, crunchy, salty, and sour stir-fry that’s weird and wonderful. Lastly, dessert. Here, I feature three sweets that have lately crossed my lips. The dark-gold net is the first of them: a large sheet of spun palm sugar, egg-yolk, palm oil, and flour that can be folded and torn just like fabric. We received these from our building’s laundress, who in turn had received a pile of them from a friend who had brought them back from somewhere in the South. She had no idea what area they are from or what they are called. I suspect they are related to kanom foy tong, in which super-fine strands of sugary egg-yolk batter are drizzled onto boiling palm oil and lifted out and folded up into smaller bundles. These are probably made the same way, but lifted out in whole sheets instead of being folded. The palm oil keeps it from being sticky in the hands, and keeps it luscious in the mouth. It is just sweet enough to overcome the richness of the egg and the oil, and the texture is addictive. The fibers coalesce in your mouth as if you really were chewing on a thin net of woven cotton, until they suddenly melt away. The little flower sandwiches are mango cookies, which are as common here as Oreo in the States. The cookies resemble a coconut short-bread, and the filling is a tart and thick mango jam. They are, needless to say, more complex than Oreos. Ken cannot resist them. It took Ascher a while to come around to them, but now he’s seen the light as well. The glossy black sweet is a rectangle of seaweed-sesame-cashew brittle. Don’t knock it until you’ve tried it. The savory seaweed provides a pinch of marine-salt that sets off the sweetness of the cashews and the sesame seeds. It also makes the brittle gorgeous: imagine if you set nuts and sesame seeds into onyx. I’ve never seen this sweet before the Vegetarian Festival, and I am crossing my fingers that it won’t disappear with the rest of the je seasonal specialties. You’ve made me hungry (even thought I just finished dinner) with all the wonderful descriptions of this food. 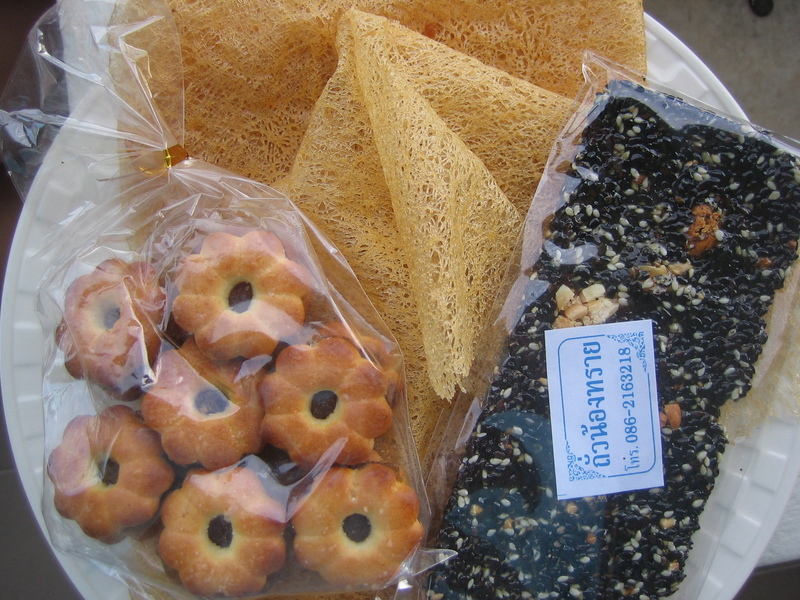 It makes me want to travel back to Thailand for the festival next year just to have a chance to try all these delicacies.